Jeff Verona leads a UW-Marshfield composition class for those who will help teach the Ho-Chunk language. The Ho-Chunk Nation has partnered with the college in its efforts to teach the language to more community members. 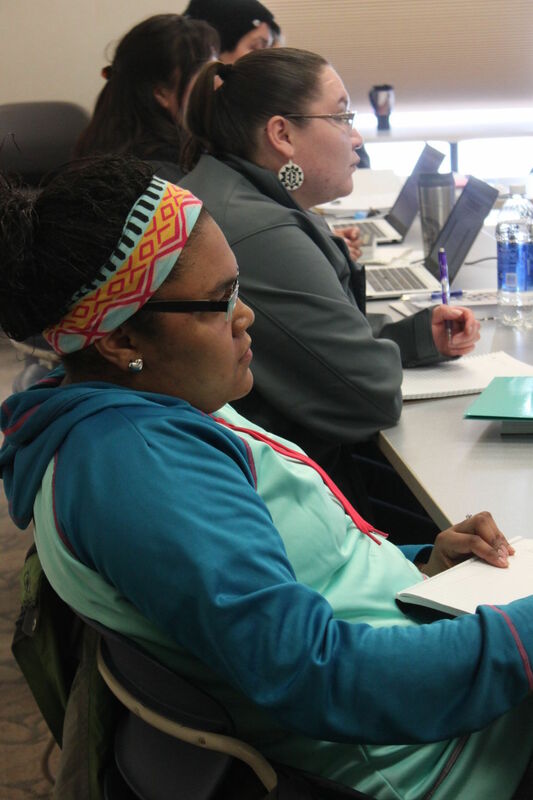 Students Andrea McCaskey, front, and Shena Munden participate in a college composition class at the Ho-Chunk Nation in Black River Falls. The program is designed to help the Nation’s language programs bring the language into the 21st century. Language teachers Dana DeBoer and Gordon Thunder find joy in hearing their high school-age students speak Ho-Chunk. The language of the Native American tribe has seen a steady decline in fluent speakers in recent years, but new and revived efforts to pass it on to future generations have begun and will be ongoing in the future. The Nation has been working to make its efforts on preserving and fostering the Ho-Chunk language more visible in recent years, including this month’s launch of new classes that are meant to take the knowledge of those who’ve recently learned the language and bring them to willing learners in the community. The Ho-Chunk Academy now is offering weekly classes in Black River Falls, Tomah and Wisconsin Dells at the same time the tribe is growing its partnership with UW-Marshfield/Wood County to provide college-level education and training to apprentices who will teach the language to a variety of age groups. The tribe is believed to currently have 100 or fewer eminent – or first-language speakers – of its native language. That’s a number that’s down from an about 300 a half decade ago. “I would say the Ho-Chunk language – we just need to continue to push it through. It’s a team effort,” said Samson Falcon, the Nation’s language apprentice program manager. “Now the language division is starting to show (the community) this is what the language division is – we’re here for the people, for the communities. We’re here to share the language, share the culture. The Nation has a group of people who have graduated from the language apprenticeship program and now are able to start to assist with teaching the community classes, which are set during both work hours and evening times to give the most opportunities to those interested in taking them. The work is crucial for preserving culture and the Ho-Chunk identity, said Angelica Greendeer, the Ho-Chunk Academy’s program manager. The Nation for several years has collaborated with school districts to offer language courses in high schools for teenage youth interested in learning. There currently are classes in BRF, Tomah and Wisconsin Dells, with the highest participation in Black River Falls – the area in which the tribe’s headquarters is located. Black River Falls has three class levels that DeBoer and Thunder share duties teaching – work that involves educating students who are passionate about learning and speaking Ho-Chunk. Classes range from word learning to composition and speaking the language and expand on the sometimes basic words spoken in Ho-Chunk homes, like the word dad that is spelled jaaji. The Nation also soon will receive results from its tribe-wide census launched last fall, and the data gathering will include information from respondents about their knowledge of the tribe’s language – another avenue for determining future education efforts, Falcon said. “In compiling that information, we’ll probably get a better view of what the situation looks like with how many fluent speakers and first-language speakers we have,” he said.